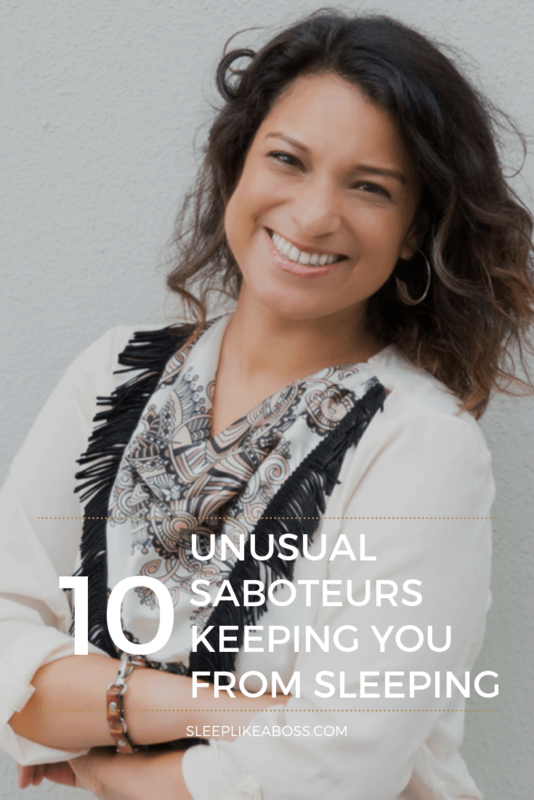 Today I want to do a little bit of a twist to these 10 items and I've inspired myself by my clients, who I realized, when I told them things, I thought were normal, had an ‘Aha’ moment, like this light bulb moment. So, I really hope that this is going to help you too. Number 1: "the earlier I go to bed, the better"
You might think it’s true, but here's a reason why this is not working, or at least not for everybody. One of my clients has a history of being quite anxious, quite pedantic, just wanting to be organized. He had a set bedtime for himself, because he knew that he would get anxious if he went later than planned. He knew, he then couldn't sleep and if he didn't sleep, then it would get even worse, and so his mind would just spin out of control. When we started working together, I asked him, how that was work for him. He told me that it takes him around an hour to two to fall asleep each night. I followed up and asked ‘okay, so once you do fall asleep, how long are you sleeping for?’ ‘Well, mostly only 'til 5:00 AM’. ‘So, you fall asleep by 11:00 PM and then you wake up at 5:00 AM?’ He confirmed by saying 5:30/6 AM. Here's the thing. He got so anxious about his perceived bedtime, when actually his natural bedtime would be later. We started to change that. I pushed him to go out a little bit, enjoy time with his family and friends, because he used to not do that. He would literally not go and have dinner with people or he would leave early in order to make his bedtime and he realized that actually he could do all of those things. but falling asleep faster and waking up at 6:30 AM is nothing unusual. A lot of you guys do that every day. It shifted his perspective so much. So consider that and maybe, if you are someone who takes a long time to fall asleep, it might be that you just go to bed a little bit too early. It might just need a little mindset shift like that. It's not necessarily Ketchup, but let me tell you a story about my client. This is a woman that I worked with and she's amazing. A super dynamic young woman with three kids. Her oldest kid is 13. (She is my age and my first daughter is four... I feel so behind...) I just worship her! However, she couldn't get through the day without having to take a nap. She just didn't have any energy. Felt exhausted all the time. So her problem was not necessarily that she didn't sleep that well, but she had no energy left and she didn't want to take pharmaceuticals and when she went to her regular practitioner, he just said everything's fine. We started talking about nutrition. She grew up in a way that she didn't know a lot of things concerning nutrition. You really don't know, what you don't know. When she described her diet to me, one of the things was, ‘well, I have a pastry in the morning, I'll have a piece of sugar at 10 AM, another one at 2 PM, another one at 4 PM. I eat a box of cookies every day.’ At the end, it turned out that she had a lot of sugar and when we got her tested for Candida Albicans, it came back positive. Candida feeds on sugar and has tons of side effects, one of which is fatigue. So through educating her on sugar and where it is in food sources, she got to know so many new things. The next time she went shopping it was just like a shift of paradigm and she came back to me and she was just blown away. ‘I picked up ketchup and saw how much sugar is in there. I had no idea! !’ So as she started doing that, she was reducing and cutting out sugar for herself and for her family. I saw her for her last session this morning and she said that things have turned around 180 degrees. 'I don't feel as bloated anymore and I know my body now, because I know, as soon as I eat something that is not agreeing with me, I know what is happening and it's just empowered me to make my decisions. Even if I have a cheat day, I know what is going to happen. I can do that decision consciously! I don't need to take pharmaceuticals!’ That’s what she didn’t want to do in the first place. I say ‘hey Simon’ and I'm referring to Simon the cat, but it could be a dog. It doesn't really matter. Your pets can be a huge sleep disruptor. When you're sleeping, you are basically not unconscious, but you are not totally conscious either. It's this weird in between state. What happens is that you react to movements around you. You can see that in new mothers and their newborn baby. They will wake up as soon as the baby is shuffling around a bit, but they might have a huge truck passing by and they would just continue sleeping. especially if they are in our bedroom. If you’re not sleeping well and you have your pet in your bedroom, my first advice would be to remove your pet from your bedroom. Get him a super cute fluffy new dog or cat bed and make sure that they have a beautiful new room / spot, where they feel cozy and secure. Try to remove them from your bedroom if you have trouble sleeping. I know it sounds so obvious, but a lot of us are sleeping on mattresses that are 15 or 20 years old and it's just too much! Theoretically, you should flip your mattress every six months, which I know I don't do, but I probably should. I do it once a year. It is recommended, you get a new mattress after 10 years of wear. Now, sometimes I tell my clients that if they sleep better anywhere else, but in their own home, it's most likely because of their mattress. sometimes you might need a softer one. I also like memory foam, especially if we have the problem that we've described before. If your partner is someone who moves a lot and you don't, memory foam might absorb that movement a little bit better. Each mattress has their kind of core positives, so you have some that are more temperature controlled, which can be very helpful, when you're in menopause or when you're just sensitive to heat or cold. Go and really do your research and don't be afraid to ask for a trial. Going to a store and lying down for 15 minutes on a mattress is super awkward, because when you're lying down you really feel exposed and you're going to be tense anyway. It's not going to give you a good insight into how you actually like this mattress and how you're going to sleep on it. Most mattress suppliers will give you a trial for your mattress. It is usually 30 days and some of them will even give you 100 days. Make sure you take advantage of that. Don't feel weird for doing it. It's totally alright, it's a big investment, so make sure you take advantage of those offers! Number five: "Your bathroom lights"
to send the signal to your body in order to trigger sleep and that it's nighttime. Light is not the only thing that is impacting our sleep. There is also sleep pressure, which is a hormone called adenosine. 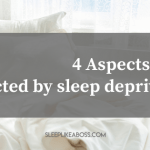 Adenosine is also having an impact on our sleep and it is definitely a factor, especially for those of you, who are sensitive to this and you might not know that you are. Make sure you try this. Get dimmed lights in there. Get indirect light, maybe even candlelight. It is amazing to just tune out and have a great time before you go to bed and relax. I would definitely recommend it and then obviously have your bedroom lights dimmed as well. Why am I saying broccoli? Here is another client story that I love to tell. I was working with one of my clients, who was very conscious of his diet. So nutrition-wise when I looked at their food journal, everything was organic, high protein, low sugar, healthy carbs, meaning low glycemic foods. If he had wheat it would be whole wheat or oats. There was just nothing that I could see that would immediately jump at me. Part of what I do, is I test for food sensitivities and we discovered that he was sensitive to broccoli. In general we would say broccoli is great. It has lots of nutrition and lots of different nutrients and minerals. So, when I saw that, I had to smile because broccoli was in high season and he had broccoli pretty much every other day. This meant that he had his gut inflamed and his cortisol levels were going up. Now cortisol is a stress hormone, it's an anti-inflammatory but it's also giving you energy; so not really helpful to go to sleep. Even though he intended to give his body something good through food, it was actually backfiring. But again, you don't know what you don't know. You might think that your kale, your smoothie and your spinach are amazing and you might have a food sensitivity to that. You might then think ‘oh, I don't drink dairy, but I drink almond milk.’ Maybe you're sensitive to almonds?! So food sensitivities are definitely a big one to look at. I don't really have that much of a story about it, because pretty much all of my clients have thyroid issues. I just had two clients, who got back to me that had to pester their general practitioner to get an ultrasound done on their thyroid, because their thyroid markers were in range according to the laboratory (I'm talking more about ranges in my thyroid blog post). Basically, when I looked at the ranges through a functional diagnostic lens, they were too high or too low. The TSH was too elevated, but T3 was too low and T4 was also struggling. I immediately thought about the thyroid affecting their sleep. So after pestering their doctor, because they felt that something was wrong with them, they finally got their ultrasound done. These are two independent clients and I just saw them because we had a summer break and one of them has two coagulans in English. In one client her thyroid had shrunk already, so the organ itself was really affected. The other client was also diagnosed with having a growth on her thyroid and being Hashimoto's. With Hashimoto’s your thyroid under performs. For her in particular, it was her conversion between T4 that was not enough and then the conversion between T4 and T3 was not enough either. through a functional diagnostic lens. The thyroid is key for me. I work with it on all of my clients, because pretty much all of my clients have an issue with it. I talk specifically about Candida albicans, which is a strain of yeast. Everyone has candida to some extent, but when we get stressed and our body starts to break down because our stress hormone is basically catabolic. It's breaking things down because it's not meant to be there long term. Candida can be very opportunistic and it spreads like a wildfire. It's not good because it's a base for bacteria and parasites and you really want to get control of it. One of the thing heavily affected by candida is your sleep. A lot of my clients will feel fatigue, but at the same time they can't sleep. Candida is definitely one that I would look out for. Number nine: "the massage shower head"
What happens is because you basically censor yourself, during nighttime you are letting your guard down. It's natural because you're starting to fall asleep. waiting to be acknowledged is about to burst at you. It's literally like having this massage shower head pouring down on you. 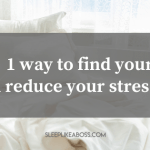 So, a good idea is to have a strategy in place to diffuse your stress during the day. In shower head terms that is basically a rainforesty, smooth sprinkle. You know, these thick drops coming down at you, really beautiful and soft. If you do that during the day, you have that constant rainy massage shower head by just acknowledging your thoughts. You don't risk at being pummeled come nighttime by everything that you just shoved into the corner. Number 10: "the warm glass of milk"
And then finally there is the warm glass of milk. I'm talking about it, because milk and dairy are something that don’t agree with a lot of my clients. to the toilet at midnight or at 2:00 AM. That makes it difficult to fall asleep again, so make sure that you keep an eye on that. Does it make a difference or not when you have a glass of milk at nighttime or anything with dairy? I know that my digestion really gets upset when I have something with dairy. So my trip to the bathroom is pre-programmed. It also gives me cramps and so on... I'm definitely not the warm glass of milk type. It has a some teeny tiny advantages nutrition-wise, but it's not worth it in my experience. I would say it’s really more of generic sleep hack that has some basis in nutrition due to tryptophan in it (precursor to melatonin) than really helping you to go to sleep. In my opinion the cons outweigh the pros in this case for most of you guys. 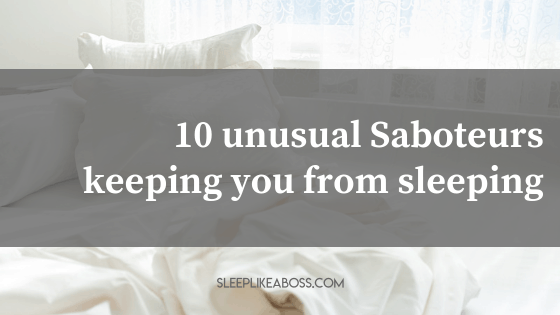 Knowing your sleep saboteurs is just the beginning . . . Being able to finally know how to combat them, and waking up actually feeling amazing and ready to face that to do list with a smile is great. Knowing exactly that you will NEVER be a hostage to them again because you KNOW what is triggering them is a different game. A game I teach.